The Love Dove Purse has an embroidered fabric design and also has a cell phone pocket, and an inside zipper pocket. It features a zipper closure and buttons as well. Comes in assorted colors. Made in Nepal at a Fair Trade Coop. 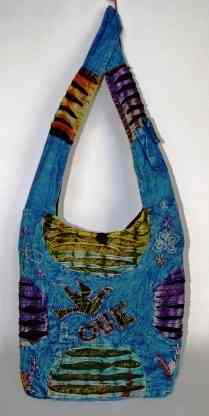 This hippie purse measures approximately 15" x 14". You can list your color preference in the comments section of your order and we cant promise, but we will do our best.